Show cows are an important part of the cattle industry in the United States. 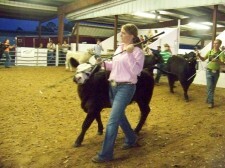 The two main focuses of show cow enthusiasts include professional or open shows and junior shows. An open cow/show is generally supported by breeders. Junior cattle shows offer children and people of less than 18 years of age the opportunity to learn more about cattle and cattle exhibitions. Teachers of Agricultural Education and County Extension Agents recommend showing cattle as a home agriculture project highly to parents as a family activity. Much like rocker/hunter Ted Nugent of The Da** Yankees says, “If you take your kids hunting, you won’t have to hunt your kids.” Families that undertake a show cattle project will spend time together at their show barn daily learning and practicing how to present your beef calf in show. This usually 30 minutes to an hour, however, some days it can be as much as several hours. Families with a show-cow project will spend a great deal of weekend time together at various cow show events. Students showing steers as a part of our local agriculture education program averaged spending seven weekends at cattle shows throughout the year. This translated into more than 150 hours per year. This makes for quality time for children and parents to be together. Having a good show-cow project takes a good deal of commitment and a lot of hard work. For beef steer projects in our area, students usually invest at least $2500 over the year. This includes $1,000 to $1,500 to purchase an average quality show steer. This also includes more than $1,000 to purchase excellent quality feed and hay for the calf. Not included in this cost is housing and dressing supplies for shows. Now, cattle showing is also sub-divided into beef and dairy animals. In the beef division, exhibitors will show both steers or heifers. For open shows, there are cow, cow-calf, and bull divisions. Thanks to such a variety people from all over the world to come and show their talents.